The NH-U9B SE2 continues the legacy of Noctua's classic NH-U9 series of compact premium coolers, which have received more than 100 awards and recommendations from the international press. 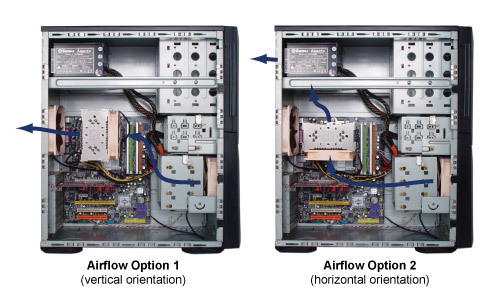 The new SE2 version lends itself to use in quiet HTPCs or smaller cases and adds support for LGA1156/1155/1150 as well as LGA1366 via the latest SecuFirm2™ multi-socket mounting system. Topped off with Noctua's award-winning NT-H1 thermal compound as well as two premium-grade NF-B9 fans, the NH-U9B SE2 offers a complete quality package for excellent quiet cooling performance. The NH-U9B SE2 is built around Noctua's premium quality NH-U9B heatsink that combines excellent quiet cooling performance with compact size, making it ideal for use in HTPC systems and smaller cases. 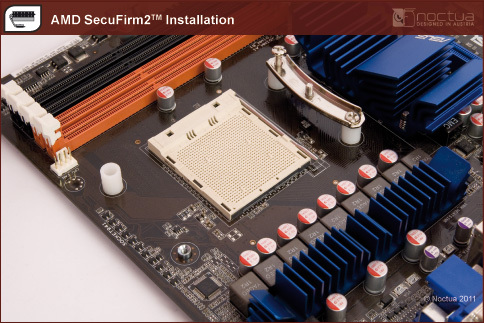 Noctua's enthusiast grade SecuFirm2™ multi-socket mounting provides broad socket compatibility (LGA1366, LGA1156, LGA1155, LGA1150, LGA775, AM2, AM2+, AM3, AM3+, FM1, FM2, FM2+) and meets the highest demands in safety, performance and ease-of-use. Including two of Noctua's award-winning NF-B9 92mm fans with Low-Noise and Ultra-Low-Noise-Adaptors, the NH-U9B SE2 offers full flexibility in fine-tuning the cooler for supreme quietness and maximum performance in push-pull mode. Bundled with a tube of NT-H1, two exquisite NF-B9 fans and the new SecuFirm2™ multi-socket mounting system, the NH-U9B SE2 forms a complete premium quality package that's backed up with 6 years manufacturer's warranty and contains everything you need in order to achieve superb quiet cooling performance. Even at default fan speeds the Noctua NH D9B SE2 does not generate much noise at all, and to the human ear it is hard to notice from a distance of one meter. Our recording equipment did measure around 22dBa. Moving to low noise and ultra low noise adapters brought further reward with dBa recordings of 16.8dBa and 16.2dBa respectively – clearly our equipment and testing room would need further improvement to measure more accurate dynamics at these settings. While shorter in stature and overall bulk, the NH-U9B Special Edition delivers decent results. At stock speeds it allows the processor to run a full 10 degrees Celsius warmer than the NH-D14 that in and of itself is an accomplishment considering it ran within 5 degrees Celsius of the TRUE and NH-U12P. [...] This heatsink as delivered, is dead silent. If that's not silent enough, then you can install the Low Noise and Ultra Low Noise Adapters onto the NF-B9 fans to further drop the fan speed and noise. Priced at 55 bucks, this heatsink is not the most inexpensive, but quality components do come with a premium. 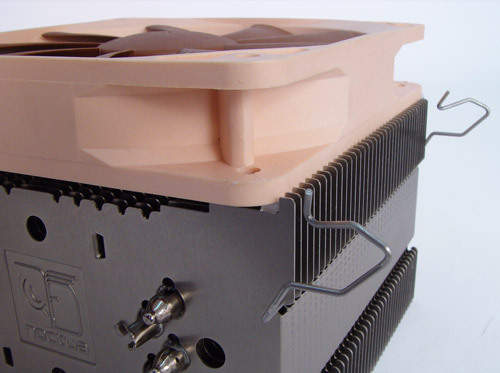 As a heatsink that uses 92mm fans, it delivers performance that exceeds that of some of the other heatsinks I have used in the past and compares well with some of the cooling behemoths on the market. Noctua's NH-U9B SE2 has proven to be a decent performer. Its quality and bundled accessories set it apart from the rest of the competition. 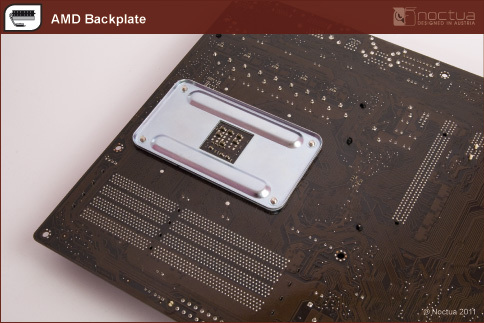 As usual, Noctua has bundled the cooler with easy to install mounting hardware for almost every current CPU socket along with a pair of excellent 92 mm fans, thermal grease, and tools to make installation a breeze. The included fans are near silent at normal 12V operation but there are also four voltage regulation adapters that, when utilized, drop the fan to 7V, or 5V to further decrease fan noise. 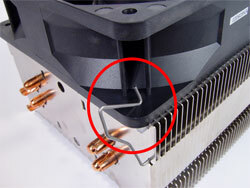 Noctua's design also provides airflow for components around the CPU socket to aid in cooling of secondary heat sources. The cooler comes with a durable Nickel plated finish that is both functional and attractive to score in the looks department. 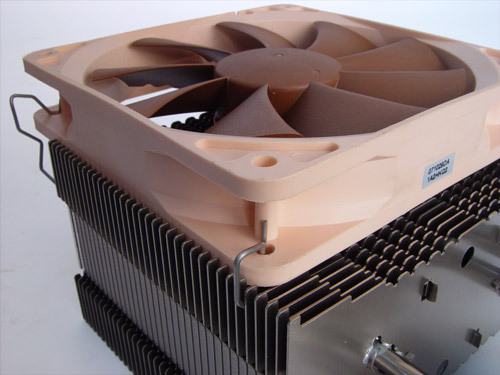 Should you run into any problems, Noctua provides a six year warranty on all their coolers. After going through the design and test review of the cooler there is no doubt that the cooler performs very well when it is put in its intended milieu. When paired with a processor running at stock speed, the cooler can keep the processor in a safe temperature envelope even without using any fans Even when the cooler is paired to an over clocked heat guzzling Core i7, it does not disappoint. The cooler was able to keep the processor under 80C. Remember that Linpack test generates massive amounts of thermal energy. Under normal operation the temperature would be much better. The NH-U9B SE2 bundle is exemplary, and the heatsink oozes quality too. The serrated aluminium fins look impressive and are said to reduce turbulence, the Noctua logo is neatly engraved into the top of the heatsink, and the four nickel-plated copper heatpipes attach to a silky-smooth contact plate. Niveau performance le NH-U9B s’en tire bien avec un delta T de 32° (Tcpu = 59]) sur notre Xeon E5-2670 de test (dont le TDP réel frôle les 115W). La ventilation étant réglée en automatique, les ventilateurs se font oublier dans le bruit ambiant du boitier. Ces performances promettent une marge confortable d’OC sur des cpu à plus faibles TDP comme les i5-xxxxK Intel. I dissipatori dell’azienda Austriaca restano sempre un punto di riferimento, qualità altissima e curati nel minimo dettaglio. Ventole fantastiche, 2 presenti in questa Special Edition dell’NH-U9B (che già sono un valore aggiunto al dissipatore stesso). Il Bundle è completo, dal logo adesivo rigido (stupendo! ), i kit di installazione AMD ed Intel, cavi per la personalizzazione della velocità delle ventole e l’ottima pasta termica NT-H1. Desde que tenemos el gran honor de poder probar los disipadores de Noctua, sabemos que son sinónimo de tranquilidad. Los austriacos hacen un trabajo espectacular tanto con el diseño de los disipadores, como el de los ventiladores, esto último infravalorado por su gran importancia. El fabricante nos da 6 años de garantía y eso es confianza en su propio trabajo que deriva en confianza de sus clientes; el rendimiento de este disipador es indiscutible, aunque para equipos donde queramos más OC y bajas temperaturas, tendremos que acudir a modelos más grandes, como las series de 14 y 15, con ventiladores y estructuras más grandes. Pero este modelo está indicados para equipos compactos, como mini-torres o equipos multimedia, todo ello sin descuidar su misión, que es la de enfriar nuestra CPU, y lo hace realmente bien, con una sonoridad excelente. Lo mejor de todo es que no forzamos nuestra CPU, podremos tener aún menos sonoridad, al poder usar los adaptadores que frenan la velocidad de los ventiladores. Un 10 para su sistema de montaje, por supuesto, fácil de instalar, y no menos importante, fácil de quitar. Ten niski tower jest w stanie sprostać i5 2500K@4,7GHz! Biorąc pod uwagę prosty montaż, dość ciche wentylatory i 6 lat gwarancji to bezsprzecznie NH-U9B SE2 możemy ocenić na 5/5 oraz przyznać mu rekomendację w aż trzech kategoriach: jakość, wydajność, kultura pracy! We know Noctua for some of the best air coolers out there, but normally their coolers are quite large and are made for full-size PC builds. 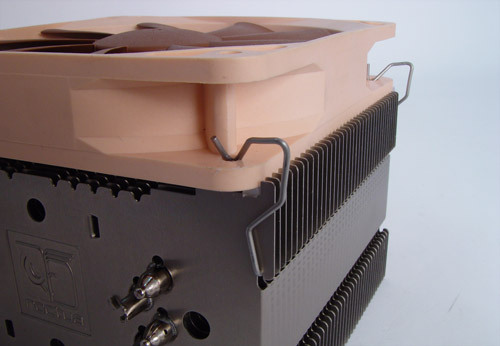 It is much harder to shrink down an air cooler and still have the same type of performance. Well it looks like Noctua was able to do that with the NH-U9B SE2 cooler. This makes it perfect for a small form factor gaming machine where you still want that great performance and might even be overclocking your processor. Now on the other hand if you wanted this cooler for say a HTPC setup it does come with both a low noise adapter and ultra low noise adapter which will slow the fan speed down making the cooler much more quiet. The cooler's fans always run at full speed and can not be controlled by my motherboard, what's the problem? Is the cooler compatible with AMD AM3+ and FM1? 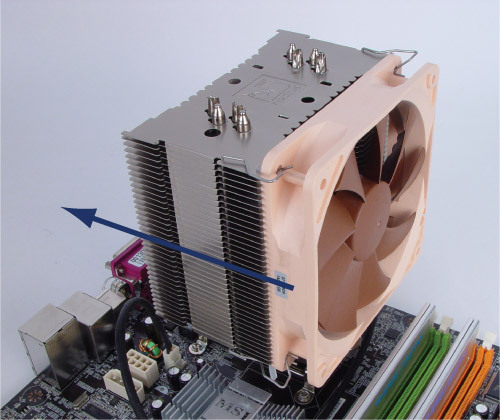 Is the cooler compatible with the Intel LGA2011 socket and Asus X-socket™? 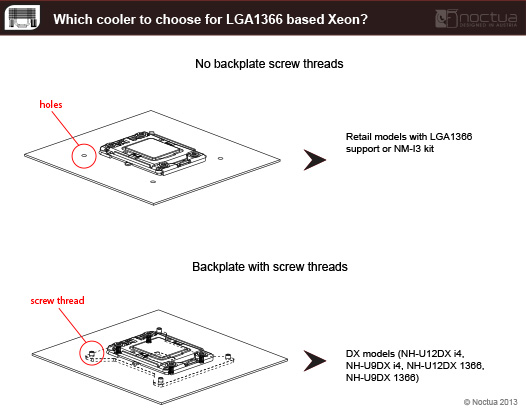 In order to install the cooler turned by 90° on AMD, the optional NM-A90 kit is required. Older, discontinued models such as the NH-D14, NH-C14, NH-U12P SE2 and NH-U9B SE2 ship with 3-pin fans that can only be controlled by means of voltage adjustment. 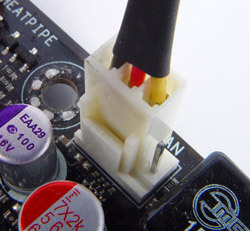 When these models were introduced in 2009 and 2010, many motherboards supported this type of speed control, whereas today, most motherboards can only control 4-pin fans by means of PWM (Pulse Width Modulation). As indicated on the resepective product pages, these models have been discontinued and superseeded by newer models such as the NH-D15, NH-C14S, NH-U12S and NH-U9S, which, like all current Noctua CPU coolers, support speed control via PWM. 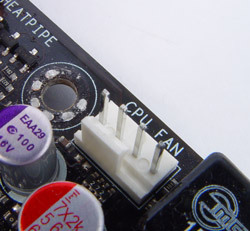 If you would like to use PWM speed control, please purchase one of our current cooler models or change the fans for some of our 4-pin PWM fans. Alternatively, you can also use the supplied Low-Noise and Ultra-Low-Noise adaptors in order to reduce the speed of the supplied fans. As the hole spacing for CPU cooler installation on AM3+ and FM1 is the same as on AM2, AM2+ and AM3, the cooler is fully compatible with AM3+ and FM1 out of the box and doesn’t require any modifications or upgrades. 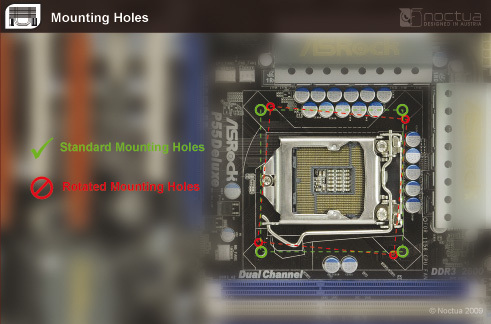 The cooler doesn’t come with LGA2011 mounting hardware out of the box, but it can be upgraded to support LGA2011 via the NM-I2011 mounting kit. Please also note that the cooler is fully compatible with Asus Rampage IV series LGA2011 motherboards that feature Asus X-socket™. 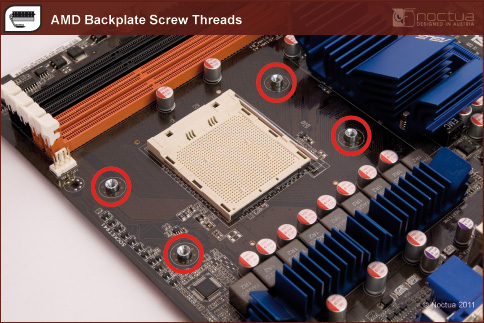 Asus X-socket™ models use an interchangeable backplate that makes it possible to install LGA1366 heatsinks, so the cooler is fully compatible with these mainboards out of the box and does not require any upgrades to be installed. 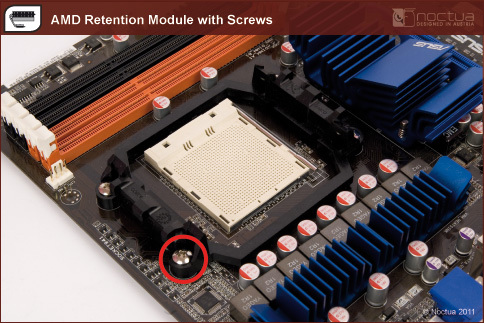 In order to install the cooler on Asus X-socket™ mainboards, please first remove the mainboard’s LGA2011 backplate and install the LGA1366 backplate supplied with the mainboard instead (see the mainboard manual for detailed instructions). 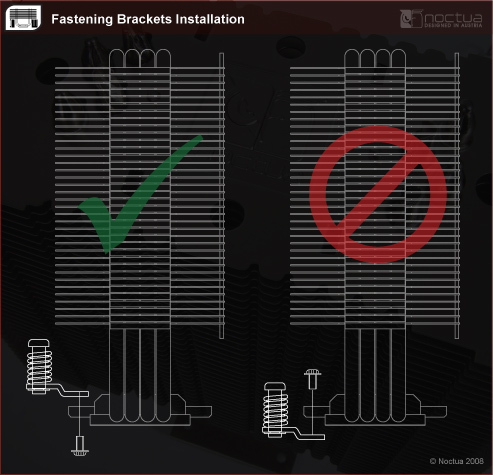 Then install the Noctua cooler as described in the supplied installation manual for LGA1366. In case you’ve lost the printed installation manual, you can download it here.